Sebastian Blanco was very good versus the Rapids. Player of the week good. The Colorado Rapids and Portland Timbers have always played some very strange matches against each other over the years. From their initial meeting in 2011 to start the Timbers' inaugural season to a Jack Jewsbury laser at the end of a match to Alan Gordon repeating the feat for the Rapids with a goal at the death, the matches always carry a lot of intrigue to them despite the team's roster state or records at the time they are meeting. September 8, 2018 will add another set of footnotes to this weirdness between the Timbers and Rapids as Portland extended its current unbeaten streak to three with a 2 to 0 victory in front of another sellout crowd. 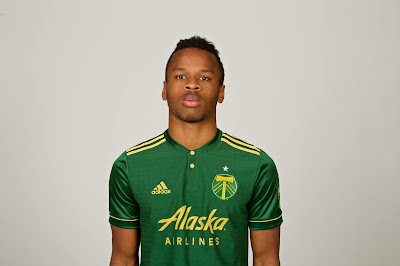 Behind the result, however, is the first start for the 2018 season for one of Portland's young strikers, 2 goals waived off by the offside flag, a Video Replay review that overturned a penalty decision, officiating that left both sides frustrated and confused and a veteran goalkeeper making his first start for the Timbers in front of the home side. Timbers Coach Gio Savarese has been preaching the need for squad rotation this time of year, and in that vein, he's used dramatically different lineups in the 2 to 0 win over Toronto FC midweek in Portland followed up by a cross country trip to New England to face the Revolution, a match that ended in a 1 all draw. Goalkeeper Jeff Attinella left the Revolution match with a leg injury to be replaced by Steve Clark, and with Attinella now out for at least 2 weeks, Savarese gave the start to the veteran Clark with young Kendall McIntosh on the bench as the backup. Savarese rotated back to use the same foursome in defense that worked so well in the TFC match - Zarek Valentin and Jorge Villafana as the right and left fullbacks with Liam Ridgewell and Larrys Mabiala as the center backs - to support Clark in his first start in Portland with Julio Cascante and Bill Tuiloma available as the subs. 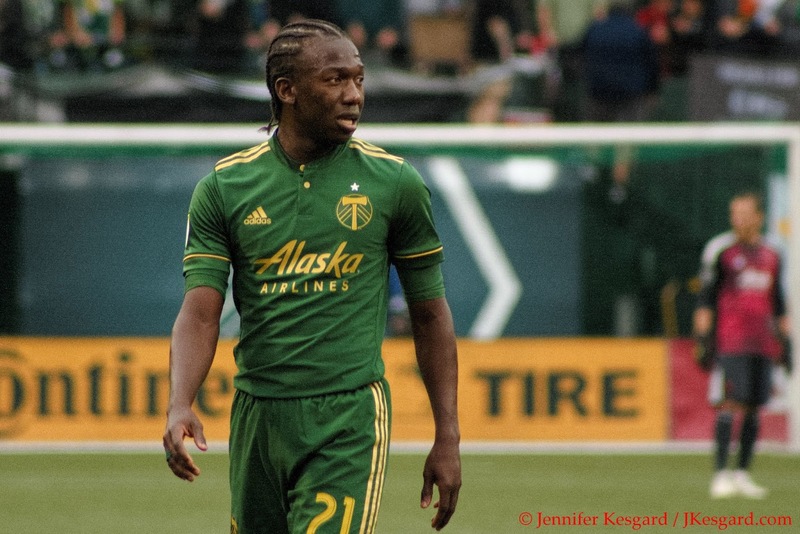 With Diego Chara and Diego Valeri getting the night off in New England, the duo were back and fresh to help fortify the middle of the Timbers' tree notable formation: 4 defenders, 3 defensive midfielders, 2 attacking midfielders and a lone striker. Chara would be flanking Lawrence Olum, the lone Timbers goal scorer in New England on the right with Andy Polo out left. 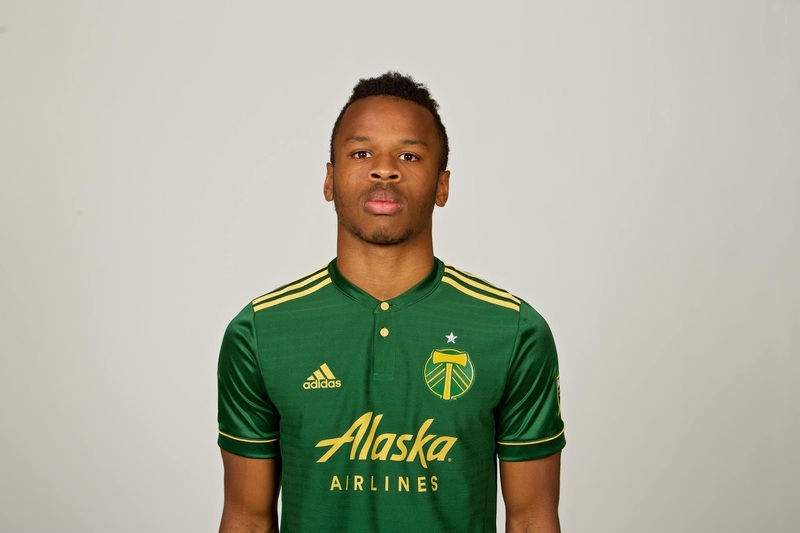 Valeri would be paired with Sebastian Blanco as the attacking midfielders in support of Jeremy Ebobisse, who was selected to start as the lone forward. Savarese chose not to play Dairon Asprilla at all, as he was excluded from the game day 18, but the other true forward, Samuel Armenteros, would be available as a substitute if needed. Savarese could also bring on Andres Flores, Tomas Conechny or Lucas Melano if he wanted to bring on some differing options, but suffice to say, Gio was doing his best to change the pace. Diego Chara was back after sitting out the last match. He was everywhere. Colorado has been trying to find their identity as a team for several seasons, as they haven't been able to sustain the momentum that was created during their dramatic cup run in 2010 before the Timbers joined MLS. New Coach Anthony Hudson has tried to employ a more disciplined, defensive style of play, but it hasn't produced the results that the Rapids faithful have been expecting. The team also traded away their leading scorer, Dominique Badji, to FC Dallas for exceptional playmaker Kellen Acosta, but Acosta wasn't available for this match due to international duty. With promising midfielder Bismark Boateng and young striker Niki Jackson also unavailable for disciplinary reasons after both being ejected in the Rapids last match, Hudson was trying to keep things straight forward and simple. In front of veteran goalkeeper Tim Howard, Hudson employed Edgar Castillo, currently the Rapids leader in points at 3 goals and 5 assists, Danny Wilson, Kortne Ford and Tommy Smith along the backline. Using 3 midfielders and 3 forwards, Hudson used Jack Price, Johan Blomberg and holdover Shkelzen Gashi in the middle with veteran strikers Jack McBean, Giles Barnes and Dillon Serna up top. Considering McBean has shown promise for years but never delivered consistently, while Serna and Barnes have shown glimpses of flash in their careers in MLS, this wasn't exactly a group that you could ignore. However, the disparity in overall talent was very apparent, so if the Timbers did everything they should on the night, it should result in a Timbers win. But like many matches this year, it was easier said than done. The two goals themselves were the result of relentless play by Blanco, who lead the team in chances created with 7. Ebobisse started the play by collecting a long pass at midpitch and deftly dropping it back to Chara in the 45th minute, and Diego spotted a charging Blanco on the right side. Blanco easily out maneuvered Castillo in space on the dribble, and before Howard or the rest of the Rapids defense could recover, Ebobisse beat everyone forward and tapped the Blanco cross into goal for his first MLS goal of the season. It was a wild celebration for Ebobisse for reasons we'll cover in a moment, but on his first start of 2018, it was a huge result to add to Jeremy's impressive stat line of 3 goals and 2 assists in just 17 MLS matches played. 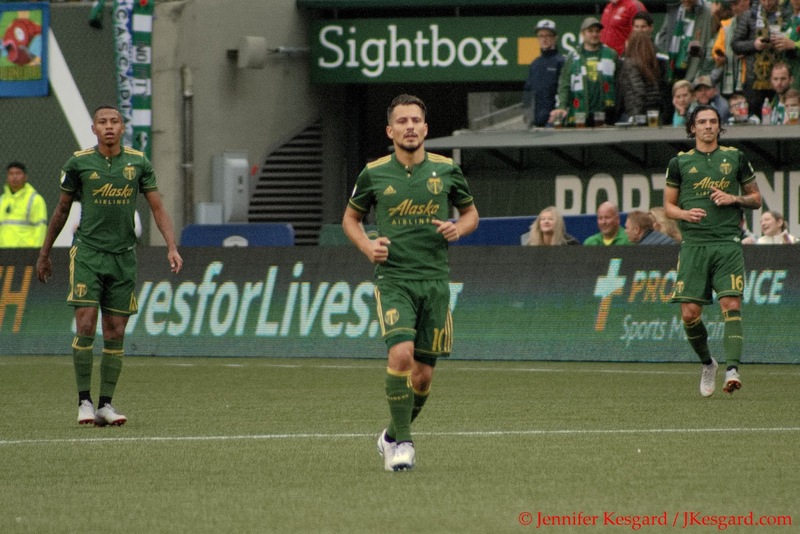 The Timbers doubled the lead in the 65th minute when Blanco outran 4 Rapids defenders on the left charging toward the North End goal, and before anyone could do anything, Blanco crossed the ball to a waiting Valeri near the spot for the easy header and a 2 goal lead. For Valeri, this pushed him into double digits for goals and assists for the 4th straight MLS season, putting him in very elite company historically. Yet by all accounts, it could be said that Blanco shot the ball off Valeri's face considering the expert placement with 4 defenders and Howard all trying to stop the run down the flank. Fans have clamored for Jeremy Ebobisse to start. They got their wish. Both goals came right after frustrating moments within the match. The Timbers already had 2 goals waived off by the offside flag in the first half, leading to much frustration with Center Official Drew Fischer and his crew. In the 12th minute, Ebobisse thought he had the elusive goal off a free kick from Valeri about 30 yards from goal, but the offside flag negated the goal and VAR review did not indicate it was a clear and obvious error, either. However, several pictures of the replay show Jeremy was in step with Gashi as the ball was struck, but Ebobisse's speed put him very much out in front. In real time, I thought Jeremy was in step and onside but I'm not one of the people with the flags along the touchlines either. That same situation negated a Valeri goal in the 29th minute off a quick pass from Blanco where Diego had timed his run and was clear of the line at the time of the pass, but the flag stopped the play. Admittedly in real time, I thought Valeri was offside by several steps, but upon the review, it does appear that Valeri was really close to keeping the play inline and it was likely a good goal. Perhaps the most defining moment of the match, however, was in the 61st minute when McBean thought he had earned a penalty kick for the Rapids with Portland holding the 1 to 0 lead. Off a cross into the box, McBean and Ridgewell had collided going for a pass and McBean kept his feet as the ball came rushing towards Clark. The Timbers keeper punched out and slammed into McBean going for the ball, and Fischer immediately called for the penalty despite the protests of the home side. After several moments, Fischer made the VAR signal that he would review the play, and upon review, it was apparently that McBean had fouled Ridgewell prior to the Clark contact, which was definitely foul worthy. With McBean's foul occuring first though, the sequence was negated and as such, Fischer waived off the penalty call. Fischer did allow the teams to play, and it produced a very physical, choppy game at points with both sides trying to make quick restarts and rushed plays to catch their opponents napping. Fischer, however, called only 20 fouls on the night despite a lot of hand checking and kit pulling with just Blomberg earning a caution for pulling down Chara on a break before the Timbers' first goal. I had actually thought there were more calls on the night, but if Fischer had blown his whistle at every bit of contact that was witnessed, the match likely would have ended 6 versus 6. Armenteros entered the book upon replacing Ebobisse in the 75th minute when he interfered with a Howard goal kick, but otherwise, Fischer was content to let the teams bump into each other. To their credit, Portland took a very deliberate approach on offense and passed the ball around during several long stretches from side to side, back and forth. This even included several back passes to Clark, who is still famously known to Timbers fans for his inability to clear out a ball for Columbus when the Timbers and the Crew played in the MLS Cup back in 2015, and Valeri scored the ball just 27 second into the match. 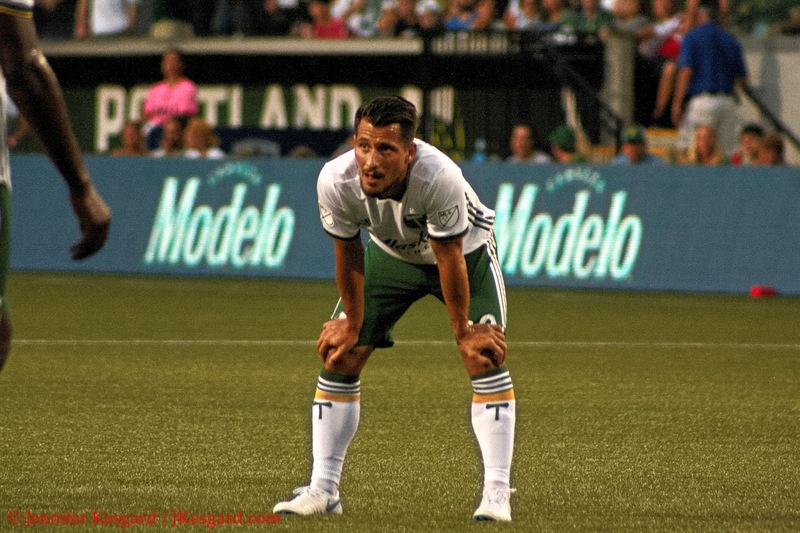 It was nervy at points and slow moving, but by the end of the match, the Timbers were confidently knocking the ball around and keeping the Rapids guessing about where to go. I will admit, the white shirt/green short look is starting to grow on me. Colorado did have 2 notable chances on goal outside of the waived off penalty, but they couldn't capitalize on either play due to the stellar goalkeeping of Clark. In the 61st minute, Barnes teed up a shot from 40 yards out off a passing sequence, and Clark pushed the dipping knuckle ball shot over the crossbar for a corner, and substitute Enzo Martinez put a challenge on frame in 2nd half stoppage off a pass from Price, and Clark was able to push the shot clear of the left post and out for a late corner kick. 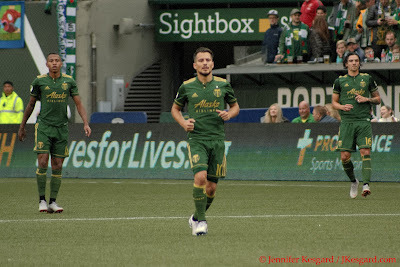 Blanco had several chances to add his name to the scorer's sheet with several blocked or missed shots, but in the end, Seba ended up with the brace in assists as the main catalyst for the Timbers' offense. His work was so good that the North American Soccer Reporters, the group of media folks that cover the league (full disclosure - I am a member of this group), voted Blanco their player of the week for Week 28 league play. To Portland's credit, their defense also held up well against a scrappy Rapids side as Villafana, Polo, Ridgewell, Mabiala, Valentin and Chara didn't let anyone wearing Rapids yellow get too comfortable with the ball near the Timbers' goal. Portland now returns to the road to start their final compressed week of fixtures, starting by playing the Houston Dynamo in Texas on September 15th. Portland then returns home midweek to play the Columbus Crew on September 19th before then jetting to Minnesota to play MNUFC there on September 22nd. This represents the last difficult road patch for the Timbers this season as they return home to play FC Dallas on September 29th. The Timbers then finish the 2018 regular season with a back to back with Real Salt Lake over 2 weeks (in Utah on October 6, RSL here on October 21) before finishing the regular season in Vancouver on October 28. Portland currently sits tied with RSL at 44 points, but playing one less match right now than Real Salt Lake. With FC Dallas (49 points in 27 matches played), Sporting Kansas City (48 points in 27 matches), LAFC (46 points in 27 matches played), Portland can certainly move up the table depending on the results. However, they also need to keep winning with Seattle (41 points in 26 matches played), Vancouver (40 points in 2 matches played and currently in seventh place) and the Los Angeles Galaxy (38 points in 28 matches played) lurking.